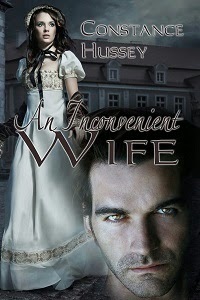 Today's featured book is An Inconvenient Wife by Constance Hussey. Only love can transform an inconvenient wife into his heart's desire. Fleeing an obsessive suitor, Anne Mackenzie finds refuge in Portugal, although she will only be completely safe in England. When she takes two children into her care, she never dreams that they will be the key to return her home. Lord Westcott can take her away from Portugal and protect her from the dangerous man in her past, but the price is high—a loveless marriage. Unless Anne can thaw the heart of this compelling, aloof stranger, they may be irrevocably bound to a lifetime of unhappiness. Unable to ignore the bonds of friendship, Lord Westcott reluctantly agrees to visit Portugal in search of a missing child. A recluse since the death of his wife and a crippling injury to his daughter, he never imagines he will return with two orphans and a wife—a wife whose dangerous secrets threaten his very life—and his long-frozen heart. Chance has thrown them together, but only love can transform an inconvenient wife into his heart's desire.